A documentary showcasing the Santiago de Cuba festival featuring rhythmic drumming, dancing and singing of the mystical Santeros, Rastafarians, Native Indians and other cultures in the Caribbean. In Santiago de Cuba, la Fiesta del Fuego (the Fire Festival) has been celebrated for nine days every year since 1980. 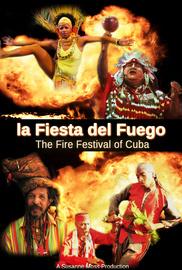 Organized by the Casa del Caribe, the festival celebrates Caribbean culture, history and religious traditions. Visually stunning footage combined with animated and informative interviews guide you on an adventure discovering Cuba’s many cultures. Communities surrounding Santiago descend upon the city to partake in the festival. Native Indians, Santeros and Rastafarians perform sacred rituals passed-down by their ancestors. Participants from a different Caribbean country are invited each year. Major events include an opening ceremony and two parades, the second of which is judged by a panel of city dignitaries and spiritual leaders. Finally, the Fiesta concludes with a spectacular burning of an effigy of the devil! The “fire” symbolizes ridding the world of all its bad influences and evil. Throughout the festival, spectators are filled with exuberance from non-stop dancing, drumming and singing. Subtitled in English for the hearing impaired. Highlights of five performances including the burning of the devil.